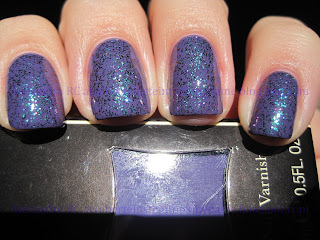 You know how I love purples and unique nail polishes, and this is exactly it. Like all Illamasqua nail varnishes, Faux Pas is easy to apply. I really like the rubbery finish on this one, and the color is very rich. Um, can you say gorgeous? I love purples and you've blown me away. Love, love, love. Oh my gosh I love this whole Illamasqua collection... was it LE? Maybe I could still get my hands on it... it looks AMAZING with 528! Best glitter ever! It looks beautiful with the topcoat. Faux Pas is also the same colour as Revlon Rock (but that's glossy, add a matte topcoat!). 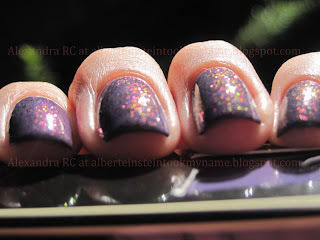 @ Amanda: thank you, this purple definitely falls under the gorgeous category. @ All Things Shiny: thanks! 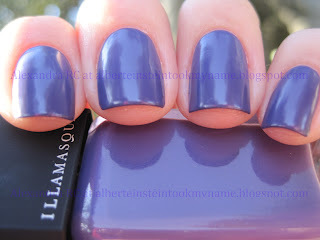 if you like creams, you will love Illamasqua. 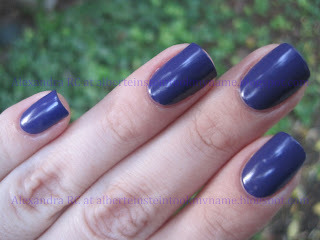 @ Fab Fingertips: I tried adding matte top coat to China Glaze Grape Pop (which is exactly the same color) and I didn't get the same effect. I might do a comparison in the future so you can see what I mean, but, bottom line is: this finish is very different from a matte finish, this is a rubbery finish.